I got an e-mail this morning asking “Why are you Proud to be an American?” For some reason, that caught my attention. I am really looking forward to the 4th of July, in all honesty,it’s because it’s a day I can spend with my family! But I realized that I hadn’t put much thought into why I have the day off. So, here is why I am proud to be an American. 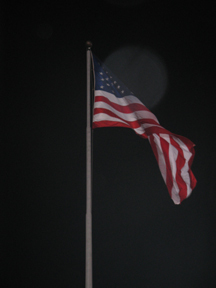 I am proud to be an American because I wake each day knowing that who I become, is entirely up to me. Dreams do come true in America. We have freedom. With a vision, hard work and passion – anything is possible. I am proud to be an American because I am granted the freedom to openly express my personal beliefs and opinions. If they differ from my neighbor’s, that’s okay, because it’s the culmination of these differences combined with respect that make our nation great. I am proud to be an American because we are a country willing to defend human rights and independence both inside our own nation and throughout the world. We may not agree on the how’s and the why’s, but I am so thankful for our young men and women of many generations that have fought and continure to fight to protect our nations’ independence and to prevent human suffering around the world. I am proud to be an American because as a nation, we care. We have heroes big and small; everyday there are random acts of kindness that we will never know about. We care about our neighbors, we care about strangers. We care about the world. We are diverse people of many different cultures and varying backgrounds, yet united, we make up this often crazy and mostly wonderful country called America. It doesn’t get any better than that and that is what makes me proud to be an American. Creating an outdoor room is something that most everyone can do. It’s really about bringing the elements that you love inside your home to an area outside of your home. It’s easy to do and I’ll bet it just might become your favorite room in the house this summer. You can convert a space around your pool, patio, deck or even in the garden; it’s easy to do and brings a fresh new element to your already special home. Begin by picking an area outdoors where you already love to spend time or even better, find an unused area to create a brand new living space. 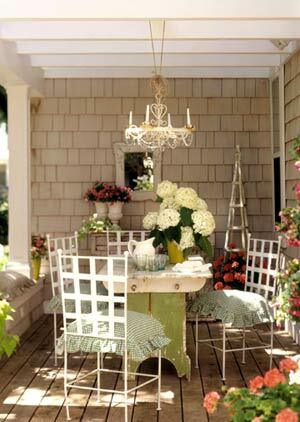 The key to a successful outdoor room is to add elements as if you were decorating a room inside of your home. Here are some suggestions to help you create your new room. If you have a deck or patio, consider adding an area rug that was made for the outdoors. This pulls together your seating and creates a homelike feeling. If you are starting from scratch, consider using paving stones, moss, or even colorful gravel to define your space. Purchased outdoor furniture works well, but also consider using a hammock or swinging chair for seating and something unique such as an old urn with a tempured glass top for an end table. Be creative, mix and match and shop yard sales for items that you can use. Lighting is as important outside as it is inside. Think ambiance. Of course candles, lanterns and a string of lights will add character, but also consider putting small flood lights focused on architectual or garden elements for indirect lighting which can create great shadows and focal points for a dramatic effect. Accessories are so often the last thing added, but certainly the most important. Try adding a fountain for it’s beauty, as well as the soothing sounds that it will create. Add a firepit and a large metal bucket for ice and your favorite drinks. Hang a picture, clock, or decorative barometer on a wall or even from a tree – be creative! Toss in a favorite garden sculpture, place a beautiful plant in an interesting container, pull up a comfortable chair – grab your favorite book and relax! By using your imagination you can create an outdoor room that is intimate, interesting and inviting. You can’t go wrong and it might just become your favorite place to be. Have a great summer!